Caro TOF (A CN 24422) was imported from Austria by Tudor Oaks Farm as a yearling. She is sired by the great and notorious broodmare producing stallion, ‘Arlberg’. This stallion has sired some fantastic broodmares around the world. Her dam ‘Catrin’ was an exceptional broodmare in her own right. Our “Caro” is one of the premier producing broodmares in the country. Through the years, Caro has produced numerous show and futurity winners, along with multiple sale toppers. 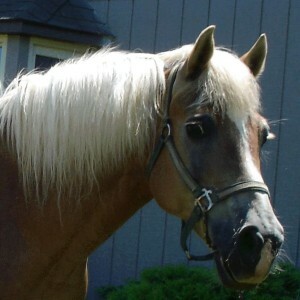 These offspring include the mare ‘Caro CAF’ who still holds the record as the highest selling yearling haflinger at any auction in the United States. Also, this same filly has earned the title of AHR ‘National Champion Draft Mare’ on two separate occasions and is currently owned by Triple B Farm. Our Caro is also the dam of ‘Capri TOF’ who was awarded many championship titles in the futurities and also the open shows for the Heinz family of Stream ‘N Acres. Caro also is the dam of many other champion offspring that are too numerous to list. Caro’s breeding dominance is carried on through her daughters as they too have proven to be exceptional producing broodmares that put foals on the ground that win at the shows throughout the country. In June of 2008, at the age of 17 years old, Caro gave birth to a filly out of our two-time AHR ‘National Champion Stallion’ and four-time AHR ‘Stallion of the Year’, Arno van het Nieshof. This filly’s AHR registered name was “Cashmere of Genesis”. However, when we first laid eyes on this little girl at less than 24 hours of age, John quickly dubbed her with the barn-name of “Guernsey” because she looked just like a little calf with the biggest eyes that we’d ever seen on a foal and a white marking centered on her forehead. The name “Guernsey” stuck and although not very flattering, it fits this filly’s giant expressive eyes and independent personality quite well! Guernsey made her first show ring debut at the AHR National Futurity. She had been weaned from Caro at only 3 months of age, about one week prior to the show, and so we weren’t sure what to expect from this filly on her first excursion away from home and into a show ring. In the junior weanling pleasure filly class at the 2008 AHR Futurity, Guernsey won 1st place and later went on to be named the Reserve Junior Champion Pleasure Weanling. She was placed in reserve only to our junior weanling colt, ‘Antourage of Genesis’. At the AHR National Show in the Open Weanling Filly division, Guernsey won 1st place against all the other weanling fillies! Not too bad for a three-month-old foal who was likely the youngest competitor in the class! If that is not enough, Guernsey went on to be named the Reserve Junior Champion Filly of the open division!! Once again, not too modest of an accomplishment for such a young lady that only left her dam’s side the weekend prior to the show! Cashmere is now owned by the Cornman Family of Pennsylvania and she has continued her winning ways! In May of 2009, Caro presented us with a large and impressive colt out of our two-time AHR ‘National Champion Stallion’ and four-time AHR ‘Stallion of the Year’, Arno van het Nieshof. ‘Apocalypse of Genesis’, as we named him, was as independent and inquisitive as his sister was last year. Despite being the youngest foal in the herd, he stood his own ground and often could be seen as the leader of the pasture-time adventures among the foals. “Paco” had some big shoes to fill if he was going to live up to the reputation of his sister, Cashmere, and all of her weanling show titles but we felt confident that this colt was up to the challenge! At the 2009 AHR Futurity, Paco was the 1st place Junior Weanling Colt in the draft arena and went on to be named the ‘Junior Weanling Champion’. Once again, this was quite a victory for this foal because he was the youngest competitor in the class! For a 2010 foal, Caro was bred to our AHR GOLD classified stallion, Alfa of Genesis. The cross between Caro and Arno has definitely produced two great offspring for us but we couldn’t resist experimenting with the genetics! In May 2010, Caro presented us with a magnificent stud colt that we named ‘Alfaro of Genesis’, a unique name that we derived from combining Alfa’s name with Caro’s. ‘Faro’ (pronounced ‘pharaoh’) made his show ring debut at the 2010 AHR Futurity. Despite being the youngest entry in the class, he won the AHR draft ‘Junior Champion Weanling’ title! Meanwhile, Caro’s 2-year-old filly, Cashmere of Genesis (link), also attended the AHR Futurity with the Cornman Family from Twin Pine Haflingers. Cashmere was named the 2010 AHR Futurity ‘Champion 2-year-old’ and also went on to win the ‘2-year-old under harness’ class. In summary, in the previous three years, from 2008 through 2010, each of Caro’s weanling offspring have won their AHR Futurity Junior Division class and went on to be named a champion of the division! October 2010 UPDATE: At the 2010 AHR Futurity, Caro’s weanling colt, Alfaro of Genesis, competed at the AHR Futurity in Ashland, Ohio. Despite being the youngest colt in the class, he was named the draft ‘Junior Champion Weanling’! Meanwhile, Caro’s 2-year-old filly, Cashmere of Genesis, was named ‘Champion 2-year-old’ and also won her driving class! Thank you, Caro, for your contribution towards Genesis Farm’s show ring success!